The term “urban acupuncture” is based off of the traditional Chinese medical theory of acupuncture. It uses small-but-powerful strategies as pinpoints for areas in need of repair. Regenerative projects serve as needles that revitalize the whole by addressing the parts. Urban acupuncture relieves stress in the environment. The process uses many small-scale interventions to transform the larger urban fabric. Water LA’s urban acupuncture strategies focus on local resources rather than bigger infrastructure and imports. These strategies give people opportunities to take meaningful personal action, to be good neighbors and environmental stewards, and to contribute to a more climate resilient future for Los Angeles. Nature can be leveraged to do a lot of work people need while also sustaining and regenerating for generations to come. 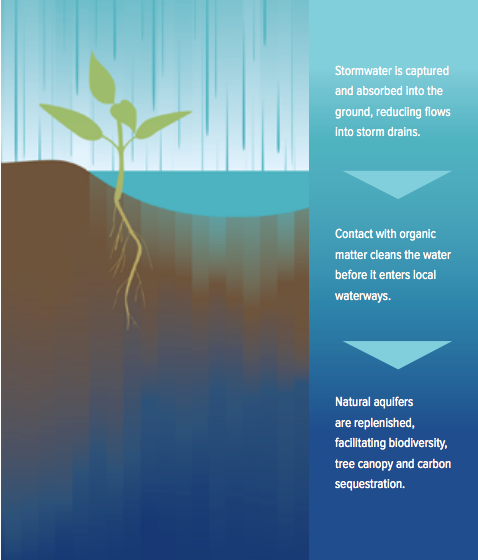 There are different terms to describe the amount of nature harnessed in different water management strategies, and also the scale at which strategies may be applied. These shorthand terms are useful for addressing challenges and discussing preferred outcomes. Projects that rely on human engineered and operated infrastructure and conventional piped drainage, and water treatment systems using primarily inert, impermeable materials such as steel and concrete. These make up most urban systems including paved streets, dams, drains, flood channels, and dry wells. Projects that rely predominantly on soils and vegetation to restore the natural ecosystem processes required to slow, detain, and absorb water, infiltrate water to aquifers, filter pollutants out of water and air, sequester carbon, support biodiversity, provide shade, and aesthetically enrich environments. Where feasible these may have the biggest long-term benefits for costs. Sometimes this is known as “blue-green infrastructure,” specifically referring to water management. These include strategically undeveloped mountains and floodplains, wetlands, rain grading, mulch, soil building, tree and vegetation planting, and parkway basins. Projects inclusive of both grey and green infrastructure and nature-based solutions. A project that maximizes or enhances stormwater capture, conservation or infiltration, in addition to five or more of the following examples: water and air quality improvements, greenhouse gas reductions, carbon sequestration, flood hazard mitigation, habitat protection and biodiversity, heat island reductions, recreation opportunities and open space, community health and safety improvements, or any combination. Cool streets incorporate elements that cool the local microclimate and mitigate urban heat island impacts. These include trees and vegetation that shades and evapotranspirates (releasing water by essentially breathing and sweating), and also high albedo materials that reflect sunlight. Complete streets are designed to accommodate traffic needs of cars, trucks, pedestrians and bicyclists. Added benefits can include more livable communities and attractive streetscapes that connect business districts, neighborhoods, parks and schools. Living streets are a comprehensive combination of cool, complete, and green streets. Green Streets are regional street-oriented projects that manage stormwater runoff close to source. They can incorporate landscaped street–side planters or swales to allow water to soak into soil and vegetation, infiltration chambers or drywells to recharge aquifers and reduce peak flows. Scale of implementation is a major factor in considering a range of approaches integrating nature. Large projects are critical in ensuring a sustainable future, from the San Gabriel Mountains—originally conserved for water resources—to the many dams and spreading grounds that help to manage water flows and infiltrate for local water supply, and the treatment plants and associated infrastructure managing urban wastewater. We want to ensure that we’re defining our terms adequately and enabling organizations, agencies and the public to align on what kind of scale implementations we’re talking about. Projects that are located on large parcels in key locations in the county, which have an average annual capture potential of more than 100 acre-feet per year per project and manage stormwater concentrations which are often downstream from the point of runoff generation. Dams, spreading grounds, treatment plants, and areas specifically protected for resource conservation such as the mountains of the upper watersheds, floodplains, and large coastal wetlands. Projects that are located on or impact either large or multiple parcels, which have an average annual capture potential of less than 100 acre-feet per project. Often these are located on public rights-of-way, which may include parks, streets, greenways, schools, and other significant public infrastructure. Projects that are simple and replicable enough that they can be spread widely and abundantly. These are public and private landscape-based projects that property owners can reasonably make and manage. Micro interventions such as rain gardens and swales, parkway basins, mulching, soil health building, vegetation and tree planting, permeable paving, infiltration trenches, and rain tanks may be included as parts of larger projects, or as stand-alone improvements. Natural systems are inherently regenerative. Natural forces such as chemical reactions and gravity move mountains, beaches, rivers, oceans, and sky. Living organisms do a lot of work in the processes of growing and sustaining life: cycling water, air, and nutrients including carbon and volatile compounds; opening up soil; and creating materials that nourish, shade, cleanse, and enrich the world around us. When space is made to leverage these forces and support life, work is constantly ongoing that humans otherwise need to input time and resources to do: producing and manufacturing materials and components; conveying water by pipes, pumps, gutters, and channels; transferring sediment and debris; and fabricating and installing increasingly sophisticated components out of expensive, labor-intensive materials and methods requiring ongoing operations and maintenance over time.